Negotiators working on a deal to avoid another government shutdown hit an impasse over the weekend after Democrats insisted on cutting the number of beds available at detention centers. Hopes for a deal by the Friday deadline dimmed, with one key negotiator saying chances were only 50-50 that an agreement could be reached, with Democrats’ new demand further complicating a debate that had previously centered on President Trump’s border wall. The White House said Sunday that Mr. Trump will build his wall one way or another, but unless lawmakers can resolve their fight, the president might not be able to sign a bill to keep the government open beyond this week’s deadline. After weeks of Mr. Trump rocking things by trying to add in more wall money, it’s now Democrats upending the negotiations by demanding massive cuts to U.S. Immigration and Customs Enforcement’s detention capacity. 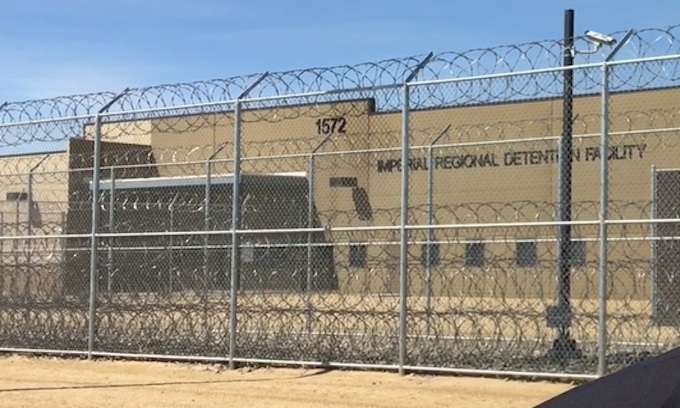 ICE is currently holding about 49,000 migrants in detention, and Mr. Trump has asked for 52,000 beds total. Democrats want to cut that number to about 34,000 beds — with an additional limit of 16,500 beds for people ICE arrests in the interior. Administration officials say ICE is holding more than 20,000 criminal migrants arrested in the interior, and Democrats’ limits would mean releasing thousand of them out onto the streets. “This is ‘Abolish ICE,'” one official said. Democrats said they doubted ICE would release criminals — though they did not provide their own numbers to counter the administration’s math. Instead, they said ICE would have to get better at prioritizing — though they acknowledged they were trying to punish the agency for its enforcement tactics. Lawmakers have just five days to sort it all out. Neither party has much appetite for a repeat of the shutdown that unnerved markets and spread misery among the federal workforce from late December to Jan. 25, when Congress agreed to reopen government and negotiate anew over border security. House Budget Committee Chairman John Yarmuth, Kentucky Democrat, and Rep. Tom Graves, Georgia Republican, told ABC’s “This Week” they’re still hopeful they can craft a bill that will make it through both chambers. Mr. Trump, who shouldered much of the blame for the last shutdown, argued Democrats are the ones who are making talks difficult. “They are offering very little money for the desperately needed Border Wall & now, out of the blue, want a cap on convicted violent felons to be held in detention!” he tweeted. Mr. Trump might still declare a border emergency and use the Pentagon to build his border wall. Congressional Republicans are skittish about that idea, saying it would set a broad precedent for presidential powers. If the president did use emergency powers, Congress could attempt to overturn it, by voting for a resolution of disapproval. That would require majority votes in each chamber — but Mr. Trump would then likely veto it, and Congress would then have to muster two-thirds of each chamber to override the veto and prevail. The House’s top Republican, Kevin McCarthy, says that won’t happen. “I don’t see any way that would get overridden,” the congressman told reporters Friday, likely emboldening Mr. Trump to go it alone if he doesn’t get his way this week. ⦁ David Sherfinski contributed to this article. The commucrats are pulling out all the stops to derail any deal on border security. Why? They don’t want border security. They want an open border. That is the sure way to bring about the destruction of the United States, and that has been their goal since the beginning. The deranged Liberal Democrats are so consumed with hate toward President Donald Trump that they have been driven effectively insane. There is no rationality to their behavior, all they care about is Hurting, Damaging and Discrediting President Donald Trump at ANY cost. These deranged Liberal Democrat leaders, Nancy Pelosi and Chuck Schumer ARE NOT working for the good of our country or our citizens. Their only goal is to destroy President Donald Trump. These hateful, traitorous misleaders and their useful idiots have no business in our country, let alone Congress. Bait, for DECADES they’ve never wanted real border security. THEY ARE OPEN BORDER globalists who think there shouldn’t BE ANY borders.. That is why all of them IMO are traitors to this nation. (2). Immediately issue allocations to ICE and other law enforcement agencies providing them means and funds necessary to sweep our nation of those illegally entrenched within our borders. (3). Immediately WITHDRAW all federal funding from ‘sanctuary’ states and cities and ‘safe havens’ and rigorously enforce the laws that we already have on the books against those who aid and abet this criminal activity that has brought a blight upon our country for generations. IV, immediately send in US Marshals to ARREST< Try and convict every mayor, governor or leader of a sanctuary state, city or town, for FAILURE TO uphold their oaths of office to DEFEND THIS NATION. V, Immediately cut ALL FOREIGN AID TO EVERY Country south of our border, Especially Mexico, who keeps showing they care NOT about stopping these INVADER Caravans. Why do you say that? Do you think it’s fantasy, to dream about our laws actually getting enforced?? for those of you dont abla or those who aint payin attention. this is the demoncrat party of today. they are trying and in some cases succeding in the destruction of america with open borders and liberalism running wild in our schools brainwashing americas sons and daughters to hate america and freedom. how much more proof is needed for good people to act on these domestic THREATS? THESE PEOPLE ARE EVIL AND WILL NOT STOP, UNLESS WE STOP IT. There is no Democratic Party any longer, it is NOW , The Progressive Socialist Party of America. Too all the brain dead libtard voters.. NO PROOF will be enough for them to wake up and realize we are being taken over from the inside out. The goal is no longer Mexifornia; the goal is a single nation from the Canadian border to Guatemala. Call it Americo or Mexica. Let MS-13 replace ICE. We can maybe talk about abolishing ICE only if & when the govt gets heads out of rears & deports every illegal alien in this nation & erects effective barriers everywhere possible along border to prevent future unauthorized entry. This nation belongs to it’s legal citizens & temporary politicians are expected & required by constitution to represent them, not foreign nationals. Do you think that the democratic desire to open the border could have anything to do with the money that the Mexican cartels are paying Democrat politicians? Follow the money! These days, it certainly makes you wonder, are they being kick backed too, by the drug and human smugglers, to be so wilfully against securing our borders. The truth is, the democrats will never allow the wall to be built. For the very reason that they continually deny. And that is because they know it will work. And when it works it will deny them their biggest voting block. The Illegal alien. The Republicans and President could cave on every democrat demand and the wall will still not be built. This has been tried numerous times in years past. The democrats simply lie and promise to get what they want, never intending to deliver on their side of the bargain. Remember Wimpy on Popeye? ‘I will gladly pay you Tuesday for a hamburger today’. With democrats, payday never comes. The Republicans, again, missed a golden opportunity to get the job done. They had control over all 3 branches of government. And they just couldn’t do what needed to be done. Good luck America. The slippery slope has become a steep cliff. America will not survive if the democrats have their way. No one is deporting law abiding citizens who are contributing to our country. Exactly. If they are Law abiding CITIZENS, there’s no need FOR ICE TO ROUND them up.. IS THERE. Democrats saying something about enforcement tactics. All any government agency is doing is enforcing laws that Congress passed. END OF STORY. In addition to the above, it might be apropos to release those that must be released into the districts represented by those who forced the release. If, as they say, those released are “upstanding law abiding people” then they should welcome them with open arms. Want to take odds on how that will fly??????? Even if we did, there’ed be no way to ensure they STAYED in those democrat zones..
We need to abolish Democrats, not ICE. D) We demand that ICE be defunded. D) We demand guarantees that the border will always be wide open. D) We demand that all of the border guards be fired immediately. D) We demand that Trump resign today. D) We demand $250 million be paid from the RNC to the DNC, as reparations. D) We demand approval of a Single Payer Healthcare program. R) OK, but we ask for an additional $10 for national defense this year. D) You are being totally unreasonable so all negotiations are now ended; so let Trump’s government shutdown begin. It’s all on you.